Design Inc has recently won a pitch for a major public information advertising campaign to help reduce burglaries at this time of the year. Five police forces in the South East have joined together to get this message across as the evenings are now dark . The integrated above and below the line campaign will include outdoor, public transport, print and online advertising as well as a number of regional roadshows. The campaign will be supported by further information resources on how to protect your home from burglars and what to do if you are a victim of burglary. 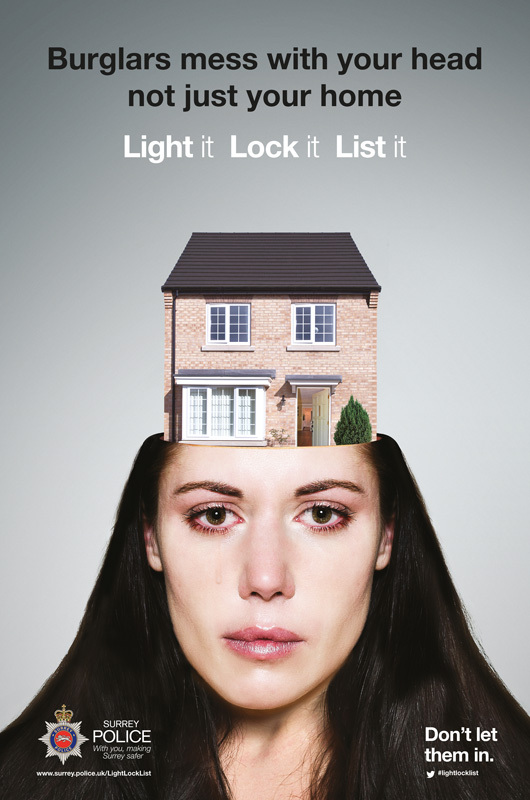 Our arresting visual combines the image of a head and a home – and the ‘Don’t Let Them In’ headline is based on the unfortunate fact that a burglar takes much more that your possessions – they can take away your peace of mind when they enter your home. Don’t let them in your home and your head. The campaign also includes the Light it. Lock it. List it. message that Design Inc developed to remind you of three practical steps that you can take to deter burglars. Juliet Smith, Corporate Communications, Surrey Police said “Public information advertising campaigns can be dry and can be clichéd; for a regional burglary campaign I wanted something memorable and thought provoking without a swag bag in sight. Design Inc achieved this and then some. Their arresting visual concept packed an emotional punch, with one victim of burglary telling me: “ That looks perfect! If I could have taken a photo at the time and the months that followed. That’s how I would have looked!” while at the same time giving simple, easy to retain crime prevention messages.